The two times I've been to Tokyo Disneyland, I've focused on the main E-Ticket attractions and mostly skipped the lesser attractions. One of those lesser rides was the Star Jets, Tokyo's version of what's called the Astro Orbiter in Anaheim. It's a flying rocket ride, and what am I really missing by not riding it anyway? Well, I'll never know, because it turns out the ride closed last year to make way for the big Fantasyland expansion in the park. 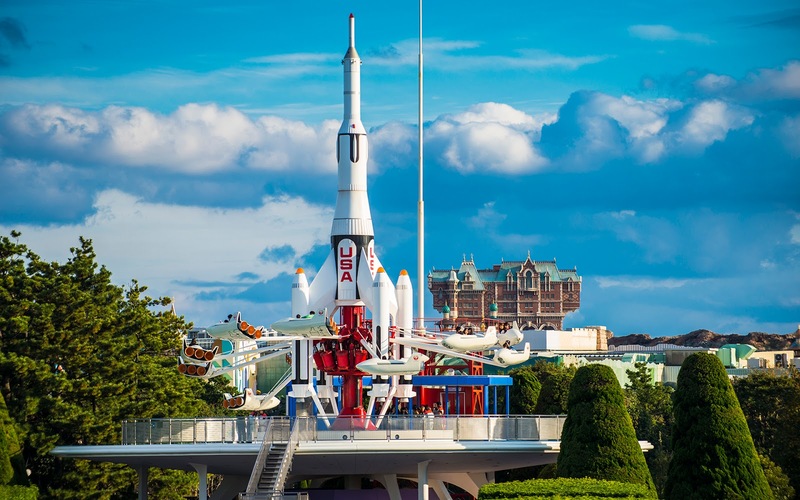 And I regret not riding it, because its elevated position gave the ride a nostalgic quality, back to when the rocket ride was atop the People Mover platform, offering an aerial perspective of the Tomorrowland around it. It was a glimpse into a Magic Kingdom that once was. And now, it's forever a part of Yesterland. Star Jets was one of the original attractions of Tokyo Disneyland but closed last October to make way for the park's long-awaited Fantasyland expansion.